Size of Male: 7-14 lbs., 13-15 in. Size of Female: 7-14 lbs., 13-15 in. A very slender sighthound, the Italian Greyhound is both spirited and dainty. It belongs to a caring home that is generous with encouragement and praise. This toy dog breed sports a beautiful short coat that is likened to satin in terms of sight and touch. Egyptian, Turkish and other Mediterranean art works that date back 2,000 years or more give you an early glimpse of this dog breed. However, you will find the actual breed populating Italy and Southern Europe during the Renaissance. These dogs became a favorite of Queen Victoria in the 19th century and gained a following of American patrons in the late 19th century. While the dogs make excellent companions, some accounts indicate that the breed was also used along with falcons during hunts. For the most part, the breed is rather shy and in constant need of reassurance and prodding. You can easily gain its loyalty through gentleness. The dogs are friendly to other pets and are kind to children. However, their nervous disposition and emotional sensitivity makes them ill suited in a discordant household that also raises dominant canines. Living Environment – The pooches thrive in a sunny climate and do best in a warm and caring home. Do not let them sleep outdoors or take them with you on your snow skiing vacation. Without exception, Italian Greyhounds simply cannot tolerate the cold. They have no problems adjusting to the buzzing city scenario or to the quiet country side. If you have a yard, remember to keep it fenced. When hooked to an interesting sight or sound, this sighthound has a nasty habit of satiating its curiosity and ignoring your calls. Grooming – Coat care is minimal for this short-haired dog. Occasional wiping or brushing should be enough to remove any dead hairs. You must direct the bulk of the grooming attention on your pet’s teeth as Iggys are prone to developing gum problems and tartar buildup. Daily tooth brushing and bi-monthly nail clipping are a must. Diet & Exercise – The Italian Greyhound eats practically anything you will feed it. It does well with an all-natural diet instead of commercial dog food. Most pet owners recommend rice and meat combinations, specifically the following: brown rice, chicken, lamb or beef, some cottage cheese, and raw fruits and veggies. The exercise requirements are generally easy to handle as well. These tiny dogs don’t have much stamina to withstand prolonged physical activities. Rather, they will benefit from daily short and sudden bursts of energy such as a short-time vigorous play session in a secure yard. Never leave the pooch unleashed and unsupervised. Health – Like many toy dog breeds, these dogs are prone to leg fractures and tail injuries. They are sensitive to anesthesia and are predisposed to a myriad of eye, hip, dental and bone disorders, including Progressive Retinal Atrophy (PRA). Despite these health risks, the breed sports a long lifespan and many sources would consider then to be relatively sturdy. For these free thinkers, house training and dog training can be challenging. 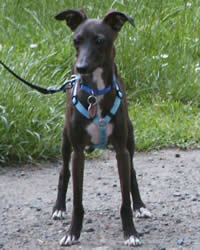 The difficulty is often compounded by the Italian Greyhound’s emotional sensitivity, curiosity and hounding instincts. If you find the dogs too much to handle, it is best to enroll your pet in formal dog obedience classes or to delegate the job to a professional trainer. Establishing yourself as the pack leader is critical to training success.